KORAPUT: Public transport came to a standstill in Malkangiri district on Sunday, the second day of the indefinite bandh call given by Maoists. Both state-run OSRTC and private buses remained off the roads to avert any untoward incident. The Malkangiri divisional committee of the outlawed CPI (Maoist) had called for the bandh on Friday night, protesting against the anti-extremism operations, and demanded withdrawal of central forces from the area. 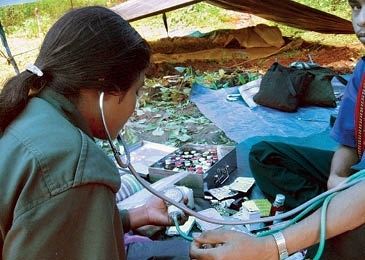 Given the recent Maoist offensives in the district, no one dared to disobey the diktat. 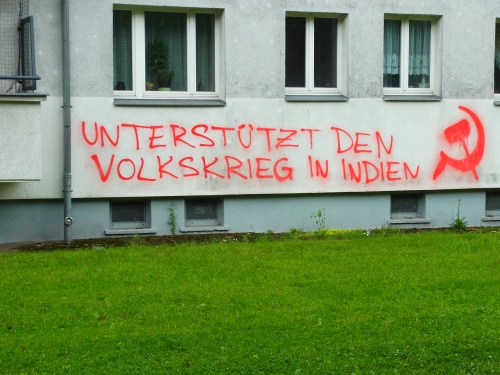 Bedingungslose Freilassung aller politischer Gefangenen in Indien! 25ter Januar 2014 – Großer internationaler Tag der Solidarität und des Kampfes! In Indien leiden mehr als 10.000 vermeintliche Maoisten in Gefängnissen, hinzugezählt werden müssen weitere Tausende von Gefangenen aus den nationalen Befreiungsbewegungen (Kaschmir, Manipur, etc.) und aus anderen demokratischen Bewegungen. HAZARIBAG: Nearly 40 Maoists, lodged in the high security cell of the Lok Nayak Jaiprakash Narayan Central Jail at Hazaribag, went on hunger strike on Thursday in protest against lack of medical facilities for the inmates. The protesters alleged that the ailing convicts in the jail are not attended to by the by the authorities in times of need. 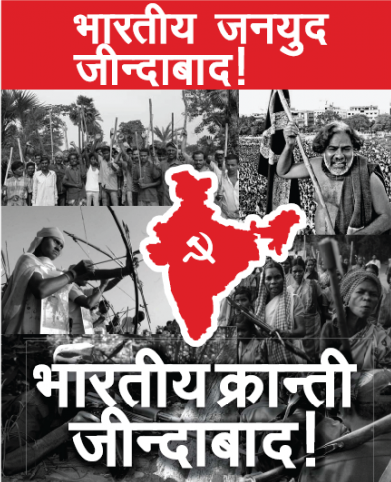 The hunger strike call was led by Ravi Sharma, member of the central politburo of the CPI(Maoist) and member of the Bihar -Jharkhand-Chattisgarh Central Committee. He was arrested in November 2009 near the Salparni Park in the district The protest was launched following the death of life convict Daso Mahato of Ramgarh district. Mahato suffered a paralytic stroke in the jail and was undergoing treatment in the Jail Hospital. Later he was shifted to Hazaribag Sadar Hospital but when his condition did not improve he was taken to RIMS, Ranchi. However, he died on December 22. This was the second death of an ailing convict in the recent times. 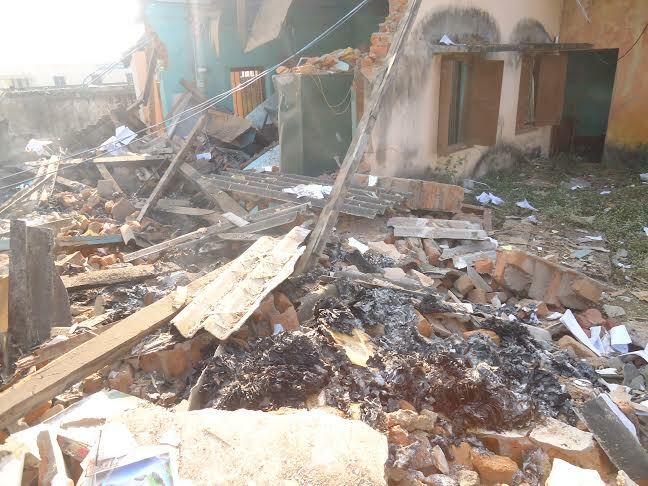 The fasting Maoists alleged that neglect by the jail authorities and the jail doctor led to Daso’s untimely death. Sometime back, another inmate died in the Hazaribag Sadar hospital after prolonged illness. The fasting Maoists said they had no alternative but to go for hunger-strike inside the jail. When contacted, a spokesman of the central jail confirmed the development. Denying allegations of the fasting Maoists, he said that in the convicts are usually treated at Jail Hospital when they fall ill and if that does not help they are shifted to Sadar Hospital. He denied the allegations of Maoists that convicts were ill treated and are not given proper medical aid inside the Jail. However Hazaribag SP and civil durgeon were not available for comments.. The next year is likely to pose a bigger challenge to the counter-insurgency operation in Chhattisgarh where the CPI(Maoist) is planning to observe its 10th year of foundation and is being feared to unite all Naxal groups in the country to carry out major ‘events’. “Senior members of the outlawed CPI(Maoist) held a meeting in the state’s Gariyaband forest bordering Odisha recently to chalk out the strategy for next year, which will see a decade of its formation,” a state intelligence bureau official said. 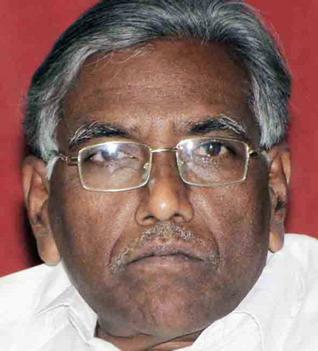 Senior Telangana people’s leader Akula Bhoomaiah was brutally murdered by the state actors in Hyderabad on Tuesday night (24th of December) at 9:45 pm. Bhoomaiah was returning from the local Press Club at Basheerbagh after a book launch on Telangana when a mysterious Garbage Tipping Van of the Municipal Corporation waiting at Vidyanagar first hit his scooter dislodging him and then ran over him till he died. This was witnessed by the people who live in the vicinity. They then promptly caught the driver who was attempting to flee after ensuring Bhoomaiah’s death. On being taken to the nearby police station and after repeated enquiries by democratic rights activists, it became clear that he was neither the regular driver of that van and nor was he supposed to be in that job. Liberdade imediata para todos os presos políticos na Índia! 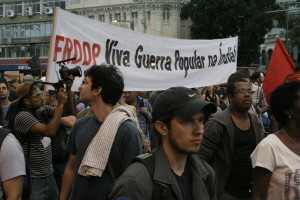 25 de Janeiro de 2014: Grande dia internacional de solidariedade e luta! Na Índia mais de 10.000 supostos maoístas padecem nos cárceres, aos quais se juntam outros milhares de presos envolvidos nos movimentos de libertação nacional (Cachemira, Manipur, etc.) e outros movimentos democráticos. El día sábado 14 de diciembre se llevó a cabo una plática sobre la represión del estado burgués en la biblioteca Fray Servando de la ciudad en Monterrey en Nuevo León. Comenzó con una plática sobre la represión en los tiempos en que movimientos guerrilleros, como la Liga Comunista 23 de Septiembre, actuaba en la ciudad, la charla estuvo a cargo de Hugo Esteve, autor del libro “Amargo lugar sin nombre”, Esteve nos explicó las distintas experiencias de algunas guerrillas mexicanas y de la respuesta violenta del Estado burgués mexicano. We call all the forces that have contributed to this work to advance together, to continue this work in every country, to use all the forms of struggle, from the propaganda, to spread information and unite masses, to the actions to hit the symbols of the Indian Regime and imperialism. 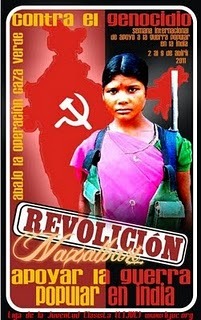 … our comrades in India are fighting a life-or-death struggle against imperialism and its lackeys. Sacrifices are big and they are being made for the liberation of humanity from the imperialist yoke by those most oppressed, those most exploited.